Today, at work, as part of a series of talks on leadership, I heard a talk by a polar adventurer and environmentalist. Sir Robert Swan, OBE, is the only person to walk to both the North and the South Poles. And what enormous adventures these were for Sir Robert in his youth. His great adventures helped pave the way for his love of Antarctica, and led to his great work–2041 (2041.com). And he’s still going to Antarctica regularly. The goal of 2041 is to protect the last great wilderness on earth now, and to prepare for the year 2041, when the agreement ends that declared that the southern continent was the property of everyone on earth. At that point, the continent could start being exploited by private individuals and nations. Sir Robert wants us to be done with mining and oil drilling for energy by 2041 so there’ll be no reason for anyone to come down to the south pole and ruin the pristine wilderness. Why would it matter what happens to Antarctica? Well, because of the effects of global warming, more and more of the vast area of ice is warming. As chunks melt and slide into the ocean, it raises the sea level. As warned about from scientists, this will submerge coastal cities and lead to disastrous conditions around the world. My goal with stevegoesgreen.com is to encourage people to move from fossil-fuel-powered vehicles to electric ones as part of the overall effort of slowing global warming and protecting the earth. So I was all ears when Sir Robert told of his 70-day ordeal hiking 900 miles from the coast to one tiny, lonely outpost at the exact South Pole. During the adventure, Sir Robert worked closely with four others, two of whom accompanied him on his trek while the other two stayed at the original coastal landing. It all worked in the end because everyone did what they needed to do, and were all leaders in their own area. The goal was clearly stated, all the details were worked out, and then followed meticulously. It took determination, cooperation, and focus to make it happen. There are many great lessons for teams working under much easier circumstances, which is why our company brought Sir Robert in to inspire us. Sir Robert’s trip to the North pole began similarly, with a larger, international group, but they ran into patches of melting ice that forced them to change their route and still try to get to the North pole in time, before their supplies ran out. They made it, but it was disheartening to see the destruction of the North Pole ice. When Sir Robert witnessed for himself the problems at the poles, he became convinced that we must do everything we can to save the earth, and has been dedicated to raising awareness and money ever since. See the 2041.com website for much more about this amazing enterprise. His parting words, which I don’t have written down, sadly, were about how we must all take leadership responsibility and not wait for others to do what must be done. If we don’t act, maybe no one will. Then, we’re really in trouble. All I want is for us to give up our gas burners and move to clean energy in our cars. But we can do it for our entire world–and in our own way, make a big difference. The Volkswagen Golf has been sold around the world for 40 years. A mainstream model in Europe, it’s less central to VW’s model mix in the U.S. However, with a major redesign for 2015 came Volkswagen’s first all-electric car, the e-Golf, and it was worth the wait. The e-Golf is aimed at pure electric vehicles like the Nissan Leaf. There is no sacrifice in driving enjoyment or practicality in choosing the electric option. In fact, it boasts the same 95 cubic feet of capacity as the gas version, with its battery tucked away out of sight. The e-Golf’s motor puts out 115 horsepower and 199 lb.-ft. of torque through a single-speed automatic transmission. This electric Golf still delivers the same fine road feel as the sporty GTI, and at 3,391 pounds, doesn’t feel sluggish. Although it didn’t rocket ahead like a GTI, at 10 seconds from zero to 60, the feel of electric motor-driven acceleration is instant and exciting. The official EPA numbers are 126 and 105 highway. That’s MPGe – miles per gallon equivalent. Use these numbers to compare electric vehicles. Pretty impressive. The VW Golf was all-new for 2015. It’s a two- or four-door hatchback, but also, in 2015 it took on the wagon role from the Jetta. Numerous engines and trim levels are available, but you can tell the e-Golf by its blue accents. VW originally sent the e-Golf to market as the loaded SEL Premium model. That means full climate control, heated seats, leather steering wheel and shift knob, alloy wheels, heated mirrors, and the like. Now, VW also offers the SE, which shaves thousands of dollars off the price by swapping out the alloy wheels for steel, LED headlamps for standard halogen, and cloth seats in place of leatherette. Federal and state tax rebates help mitigate some of that cost as well. Charging is simple. However, using household 110/120 volt current, it could take you 20 hours to fill the battery from empty. A 220/240 volt charger, which you’d install at your house if you owned the car, can do it in less than 4 hours. The e-Golf SEL or SE with the optional Quick Charge package has the SAE combined quick charge socket, so you can get an 80 percent charge in 30 minutes in a pinch. The SE starts at $28,995 with the SEL at $35,595. The SEL earns its extra price with things like Driver Assistance, Navigation, leatherette upholstery, quick charging, and more. The SE with the quick charge option is probably the sweet spot. Leasing remains the way to get into one of these cars surprisingly affordably. My Pacific Blue tester was a delight. Electric motoring is smooth and pleasant. With an 11-mile commute at the time I tested it, I had plenty of charge left over at the end of the day. This is an ideal commute vehicle, with its quiet, spacious interior and gasoline-free ways, but as with any other electric car (except a Tesla), you’ll need another car for long trips. The all-new Volvo XC90 is a handsome, luxurious, comfortable, fuel efficient, and expensive large crossover. All all new, it’s a huge step forward for the Chinese-owned Swedish brand. The regular gasoline versions are badged T6’s, but my car I tested was a Volvo XC90 T8, the world’s first seven-passenger plug-in hybrid SUV. All XC90s share a potent 2.0-liter four-cylinder engine that uses both super- and turbo-charging to put out 313 horsepower and 295 lb.-ft. of torque. The T8 adds an electric motor and a battery pack to deliver limited electric-only motoring and a total of 400 horsepower and 472 lb.-ft. of torque. I drove my 18-mile commute entirely on electricity once, but normally achieved just under that. The center screen shows graphical and digital statistics, and where the power is flowing. Hybrid system settings are Hybrid, the default mode, which switches back and forth from fuel to charge. Pure mode means all-electric. Power mode combines the motor’s instant torque and the gas engine’s size to provide V8 level performance. Save mode lets you retain the battery charge for later use. 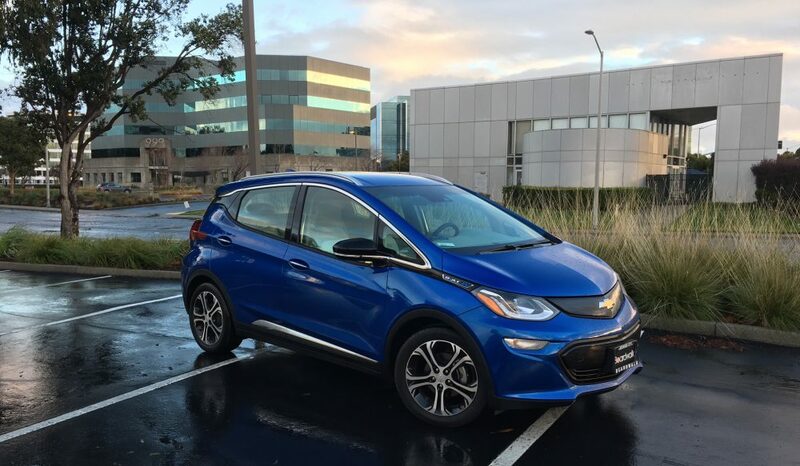 An EV range in the teens is typical for plug-in hybrids, and remarkable for a 5,059-lb. vehicle. The EPA gives it a 53 MPGe rating (compare that to other battery vehicles). In pure EV mode, it’s much better. Gas-only delivers 25 MPG. My tester averaged 22.7 mpg over 63 hours and 1,578 miles, including previous journalist loans. Green scores are 7 for Smog and a split number for the Fuel Economy/Greenhouse Gas rating—7 for MPG and an 8 for CO2. Pricing for the T8 starts at $69,050. My tester, with the $3,500 Inscription level upgrade, plus a raft of safety, convenience, and style packages and features, came to $84,005. That’s a big price tag, but this car is a great experience.It’s filled with luxury features, including an Orefors crystal shift knob and some beautiful food trim. The XC90 T8 was named Green Car Journal’s Luxury Green Car of the Year, and is part of what is a welcome resurgence for Volvo, a brand with a historic commitment to safety, today’s latest technology, and now, a greener way to move a family of seven. Yeah, it’s not a full-fledged EV, but it’s a move in the right direction. I’m look forward to Volvo offering a full EV before too long.